It’s been a few days since I’ve posted. Dh and I finally got around to putting the windbreak up for the run. We spent all of Monday painting the press-board with exterior paint, so it won’t go bad. Then DH secured them to the post around 3 sides of the run. During this process, we had lots of ‘help’ and not any of it from Little Dude, who was in school. The chickens decided they needed to supervise. They checked out the boards, the paint and the tools. Dottie even came away with green specks on her wings. It’s going to be a permanent addition to the run, but the chickens are terrified of it right now. They can’t see what’s beyond, so it freaks them out. My other chicken-related project was suet cakes for the winter. My mother makes them for the wild birds, to hang in her feeders, so I thought it would be a good idea to try for my birds. Besides, they sell seed cakes for chickens in the feed stores, so a home-made one can’t hurt, right? I researched various recipes on line and saved a couple to my Pinterest chicken board but in the end, decided to try my own mix of things. 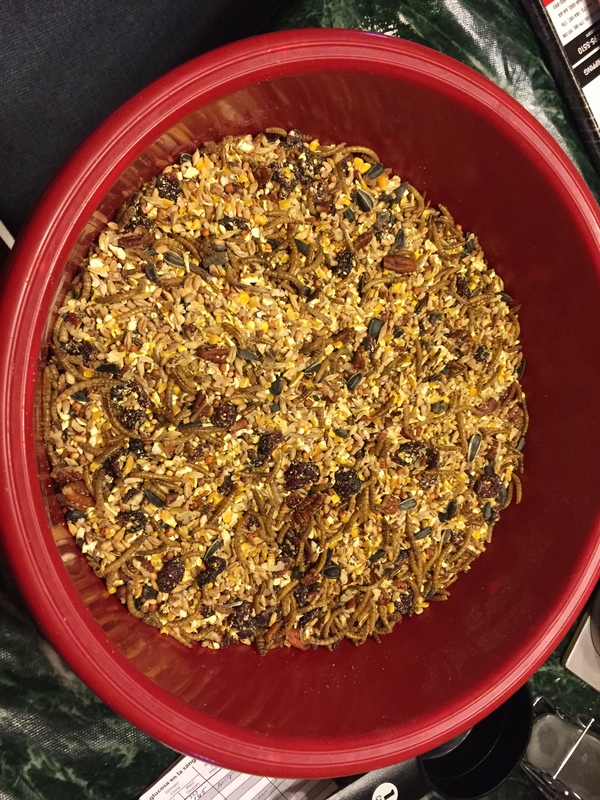 I started with this big red bowl, which I filled with one feed scoop (each) of cracked corn, wild bird seed (has black sunflower seeds) and meal worms. Next, I added two cups of dehrdrated cranberries, and a 10 ounce bag of pecan halves, which I crushed into pieces. I stirred it all together so they were well mixed. Some recipes I’ve seen include whole oats, feed pellets, cayenne pepper and various herbs. I didn’t do any of that this time. Mom makes hers with honey and peanut butter. I didn’t do that either, because none of the chicken-specific recipes I found online included them. And also because I’m guessing the peanut butter is something they don’t need a lot of in their diet. I could be wrong on that but it just seems like too much fat, especially since I’m already adding suet. My suet is bacon drippings we’ve saved up in an old coffee can. The bacon is from a home-grown, home-butchered, home-processed pig that my nephew raised. He does two or three pigs a year and they do all their own processing, etc. The bacon is only lightly smoked, and not a whole lot of salty. Very healthy, as bacon goes. This I melted into a cast iron skillet on the stove and gradually stirred in my seed mixtures. When it was all warm and thoroughly coated with the melted bacon grease, I scooped it into these mini bundt pans and sandwich keepers, and placed them in the freezer. I’m hoping it works because I want to string the ones in the mini bundt pans from the ceiling in the coop, because I think the chickens will enjoy the challenge of pecking at them. The other ones are for Mom’s suet feeders. Mom doesn’t think they will work because I didn’t use peanut butter and that (in her opinion) is what holds the seeds together. You might want to cut some small holes in the windbreaks. I know it sounds like a dumb idea, because it will let some wind through, but it might prevent strong winds from taking the whole thing down. Also the birds might appreciate some little peekholes (properly protected from predators with hardware cloth, of course). I’m not sure it will come down. The winds do get string but DH anchored those boards to the posts and the posts are sunk pretty deep in. We’ll see, anyway. I do think you’re right about the peepholes though. I think that’s why they don’t like it, because they can’t see around it. With the old fence, they could see through.